Katy Etherington always wanted to do something connected to art as a career, but she just wasn’t sure exactly what. After finishing mainstream school she decided to come to National Star to develop her independence skills and study design and photography. 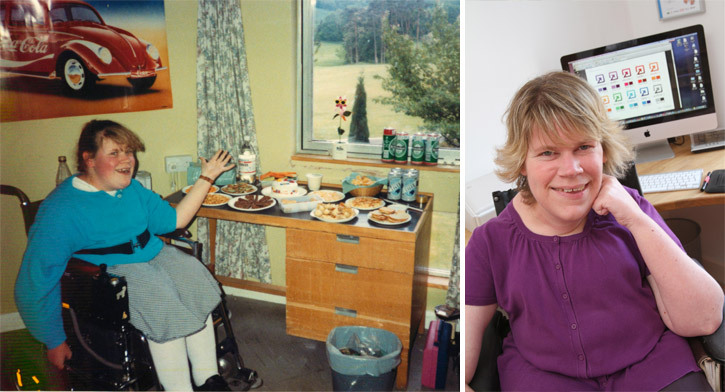 Katy, who has spinal muscular atrophy and uses a wheelchair, was a member of the Student Union and was quite possibly the founder of the students’ StarBar. She started a refreshment bar during the weekly discos which sold drinks and pizza. When Katy arrived at National Star the art department was in a terrapin hut behind the Manor. Then she benefited from the new creative arts department which was opened by The Queen in 1991. It was the culmination of the plans that had been first drawn up seven years earlier and the most expensive project at the college to date. The creative arts department moved into its current home, the PJ Crook Arts Centre, in 2011. The former creative arts building now houses the multi–media department. After National Star she went on to earn an HND in design and worked for 12 years with a design agency, progressing to be a senior designer. Katy now works as a freelance designer from her home in Hertfordshire. She also set up her own company – PA Pool – a website introduction service for people with disabilities and personal assistants. In 2012 Katy won an Association of Colleges gold award for founding it.